DURACELL - D370/371 Watch/Electronic Silver Oxide Battery, 1. 1.5 V Silver Oxide replacement battery can be used for watches thermometers handheld games calculators and more. DURACELL - CR-1025 Lithium Watch/Electronic Coin-Cell Battery Charge up the performance of your favorite gadgets with the Duracell DL1025B 3 - 12 V Lithium manganese dioxide General Purpose Batteries. DURACELL - MN21 12 Volt Alkaline Battery for Keyless Entry Sy Delivers long-lasting dependable quality in wide range of everyday devices. 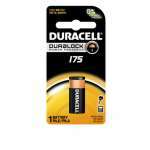 DURACELL - CopperTop 12V 21 / 23 (8LR50 / A23 / MN21) Alkaline Battery 4-pack Battery Voltage: 12V Feature: Sold as 4/Pack. DURACELL - The primary usage of the Duracell PX625AB 1.5 Volt Alkaline Photo/Electronic Battery is cameras pagers calculators and medical equipment. This battery can be safely disposed of with normal household waste.